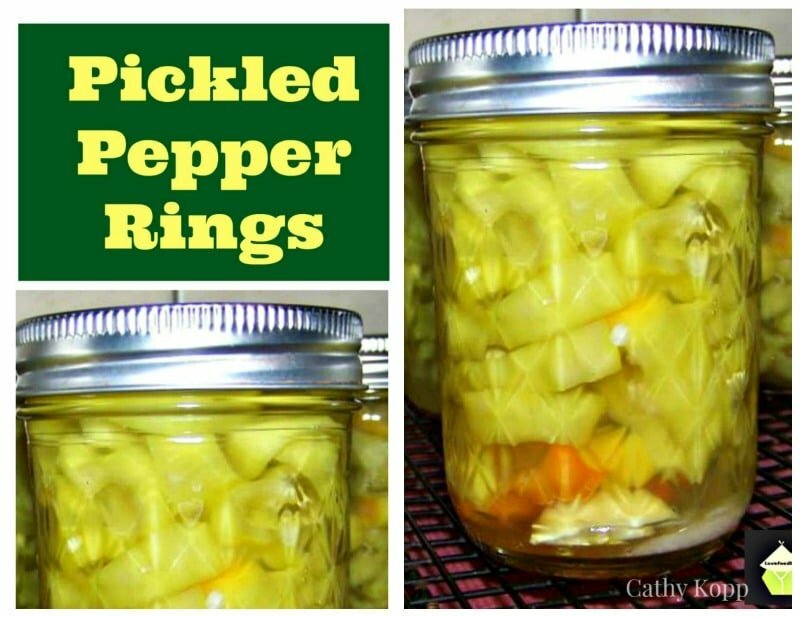 Pickled Pepper Rings – Grab some peppers and make a few jars of these Pickled Peppers. Great for gifts or parties, game nights etc with cold cuts. Cathy is always busy in her garden harvesting all kinds of wonderful fruits and vegetables. Here, Cathy’s harvested some Hungarian Hot Wax Peppers (similar to banana peppers). These are similar to the ones we get on our Italian sub or on a pizza from a sub or pizza shop in the US. 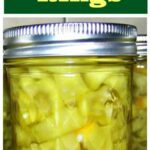 You can of course use this pickle recipe for other vegetables you wish, so it’s very flexible! Cathy has been lucky enough to have a bumper harvest this year and has made this recipe up to share with us all. 1. Bring to a boil the first 4 ingredients. 2. Wash peppers and cut into rings, removing any seeds. 3. 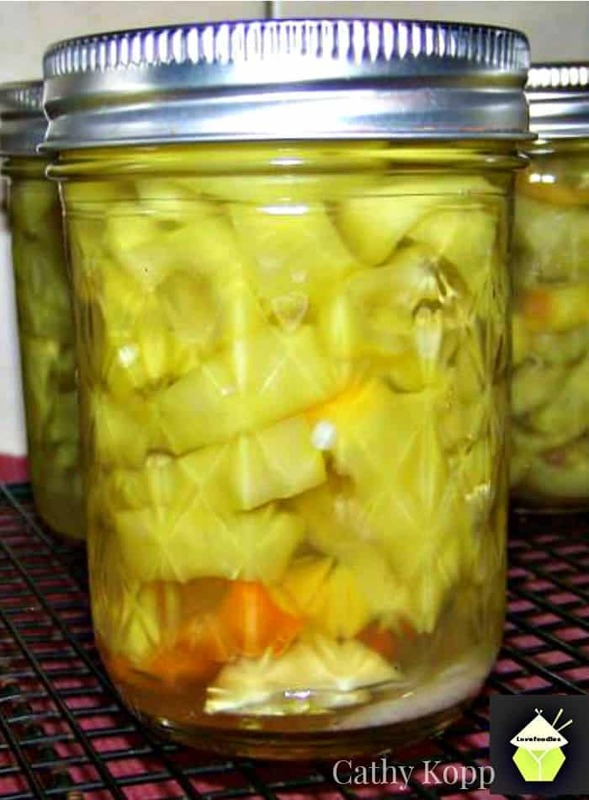 Place garlic, dill, salt, and oil into sterilized jars; pack in peppers. 4. Pour hot brine over, leaving 1/4 inch headspace. 5. Wipe rims, seal and hot water bath for 10 min. Bring to a boil the first 4 ingredients. Wash peppers and cut into rings, removing any seeds. Place garlic, dill, salt, and oil into sterilized jars; pack in peppers. Pour hot brine over, leaving 1/4 inch headspace. Wipe rims, seal and hot water bath for 10 min. First time canning banana peppers. They turned out great. I made three batches because I had picked every banana pepper I had today. Next time I will def use the pickle crisp another reader recommended for crunchy banana peppers. Add so Ball Pickle Crisp for a nice CRUNCHY pepper !! Can someone tell me what the oil in canned peppers is for. I slice jalapeno peppers and add the dill and garlic. But I have seen other recipes that call for oil. I’m just curious as to what it is for. Hi Libby, the oil acts like a brine or preserving agent when canning, you know like you can often get sun dried tomatoes in oil, or sometimes olives in jars with either oil or a salt based water. It’s just another way some people use to preserve the food, then the oil is sometimes also used in cooking things as it will have extra flavour. Hope this helps!